The projects’ PI Geoff Bright talks about a “poetics” emerging from the Ghost Labs. There were many incredible moments that were enabled by the care and solidarity within that process; you can see and hear glimpses of what came from our ‘Song Lines’ project through the films of Steve Pool and the video ballad of Ribbon Road and Carl Joyce. On this page though, we highlight the work of participants that came from activities in the Ghost Labs faciliated by poet Andrew McMillan. These activities developed and changed over the three projects, but the speed, honesty and power with which these words emerged continually amazed the research team and speaks to the possibilities unlocked through the Ghost Lab process. As part of the first 2015 project ‘Working with Social Haunting’ two Ghost Labs were organised at the National Union of Mineworkers headquarters in Barnsley that involved Unite Community members from across South Yorkshire. As part of the 2015 Rochdale Literature and Ideas Festival, the Social Haunting team ran Ghost Labs in the Rochdale Pioneers Museum – the birth place of the modern co-operative movement in the UK. In the 1840s, in this building, food began to be sold that was of better quality and at fairer prices than in the past. In the writing workshop in Rochdale, as in Barnsley, ‘emotion’ and ‘place’ were brought together. Our second project, ‘Opening the “unclosed space”’ aimed to bring together contrastingly diverse and changing communities, from the coalfields of North Staffordshire and of urban East London to explore the presence of contested pasts – and their utopian possibilities, in the present. As part of the AHRC Connected Communities’ Utopia Fair 2016 at Somerset House in London, we introduced a new activity of Community Tarot cards ‘reading’ to our Ghost Lab with participants from the Voice of Youth club, in Hackney. The cards were developed by members of our team and featured single images and words. One girl picked the cards marked with the words ‘SLEEP’, ‘SUMMER’ and a third featuring a drawing of a petrol station. 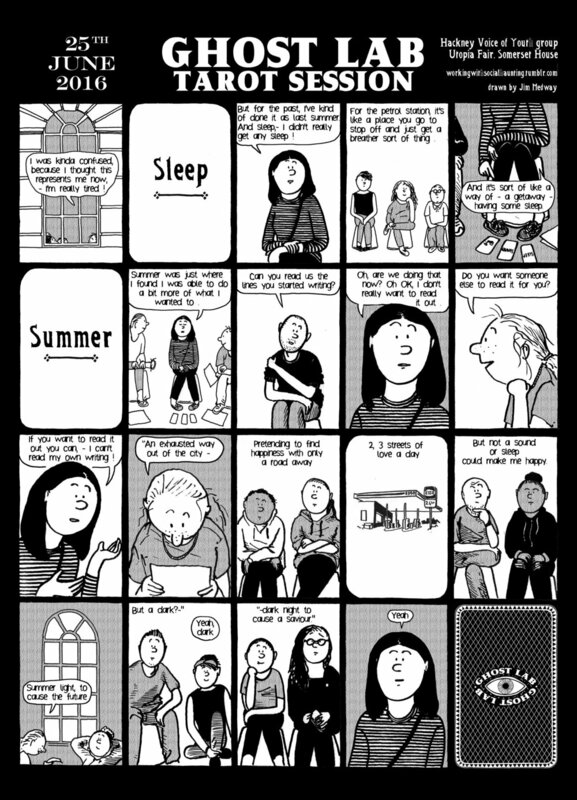 Here is comic artist Jim Medway’s depiction of the girl explaining her thought-process as she considered the Community Tarot cards. Tania, the group’s youth worker, then offered to read aloud what the girl had written. This is what the girl wrote, spoken by Tania. During the ‘Song Lines’ project, a poem was put together collectively by participants of the Ghost Lab at the Burslem Jubilee project in North Staffordshire. Users of the centre are refugees and asylum seekers. They had explained with great clarity – through words and in drawing on blank Community Tarot cards - what they had been through in their country of origin, during the journey to the UK and their feelings of loss, yearning and of hope. In this final activity of the day, each person contributed one line to a group poem. It is here in English and Arabic.